Cashing personal checks can be difficult if you don’t have a bank account. When you have access to the bank that the check was written from, you may be able to cash the check at that branch without having an account of your own there. Without a bank account or access to the bank where the check was written, you will need to rely on a check cashing business. Find a list of local check cashing businesses in your local yellow pages or online. Call each business to inquire about the fees charged to cash a check, as well as any documentation you will need to take with you. Generally you will be required to submit one or two forms of identification such as a driver’s license, passport, work ID badge, even a credit card with your picture on it. All check cashing businesses charge a small fee, so calling around will allow you to find the lowest one, putting more cash into your pocket. Visit the check cashing center with your identification and personal check in hand. Identification helps the business verify that you are who you say you are and that you’re not trying to cash a fraudulent check. 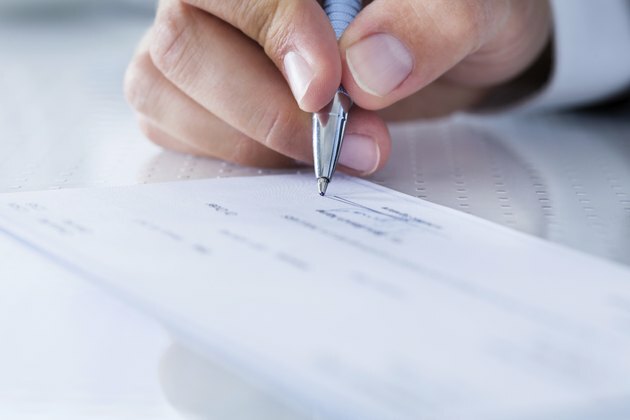 Give the signed check and your identification to the teller and receive your cash in return, less the service fee. One advantage of using a check cashing service is that there is no holding period like at some banks. You will have your money in minutes, as opposed to three to five days at some banking institutions. Go on your way, it’s as simple as that. Use your new cash to go shopping or pay bills. Some check cashing businesses also offer utility bill payments, making it a one-stop shop for many consumers. What Happens When a Checking Account Is Garnished?